is celebrating the third anniversary of its acquisition by Google by showing off an awful lot of O's. The little video site that could announced on Friday it was now streaming a full billion video views a day -- the majority of which, I have to assume, consist of cats playing music and teens doing awkward dances. Still, a billion views a day is nothing to say "Numa Numa" over. YouTube has come a long way in a short time -- evolving much, you might say, like the dance moves shown in its most viewed video of all time. YouTube entered the world cold, naked, and confused in April of 2005. That's when the service's first video, a frank and engaging discussion of elephants, surfaced on the site. The guy seen in the clip is Jawed Karim, one of three fellas involved in YouTube's founding. He and his cohorts met while they were all working at PayPal. One of them even designed PayPal's now-ubiquitous logo. As the story goes, Steve Chen and Chad Hurley -- the other two dudes -- got a burst of inspiration when they realized how tough it was to share videos they'd shot at a dinner party. They started chatting, they say, and came up with the concept of a site that'd make casual video-sharing quick and easy. The extent of Karim's involvement comes with plenty of questions. As this 2006 Time story explains, his role in the company has been minimalized in many accounts. He, however, says the dinner party never occurred and that he came up with the initial idea. Whoever thought of it, the initial concept wasn't exactly what you'd expect. YouTube's original goal, its founders have said, was to build a video version of HOTorNOT.com -- you know, the site where you look at a bunch of uggos and rate just how repulsive they actually are. Sure enough, early renditions of the YouTube home page include fields asking your gender and the gender and ages of people you're "seeking." Needless to say, that setup didn't last for long. Within months, YouTube evolved into a hodgepodge of videos, featuring whatever random stuff people saw fit to upload. 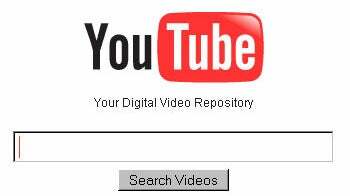 The slogan "Your Digital Video Repository" soon popped up beneath the now-familiar logo. The goulash-like approach worked wonders: By November of 2005, before YouTube had even officially launched, investors started pouring millions of dollars into the operation. The site opened its doors to the world that December, and less than a year later, Google came calling. "Google is looking for its second act. However, the second act will require more storage and processing power than we have ever seen." Hey, we could talk all day about YouTube's triumphs, trials, and tribulations. But wouldn't it be far more fitting to wrap things up with some shakily shot, user-created video? The YouTube team itself uploaded a "Making of YouTube" clip that shows memories from the company's early years and its transition into Googledom. And a Kansas State University anthropology class created a "History of YouTube" special that takes a walk down YouTube's first two years. It's complete with cheesy music and a sappy ending that'll leave you inspired... to hit the stop the button. When not watching kitties dance on YouTube, JR Raphael gets jiggy at eSarcasm, his site for all things geek humor.